Things have been pretty busy around here this week as we have been preparing for Buddy’s first birthday! 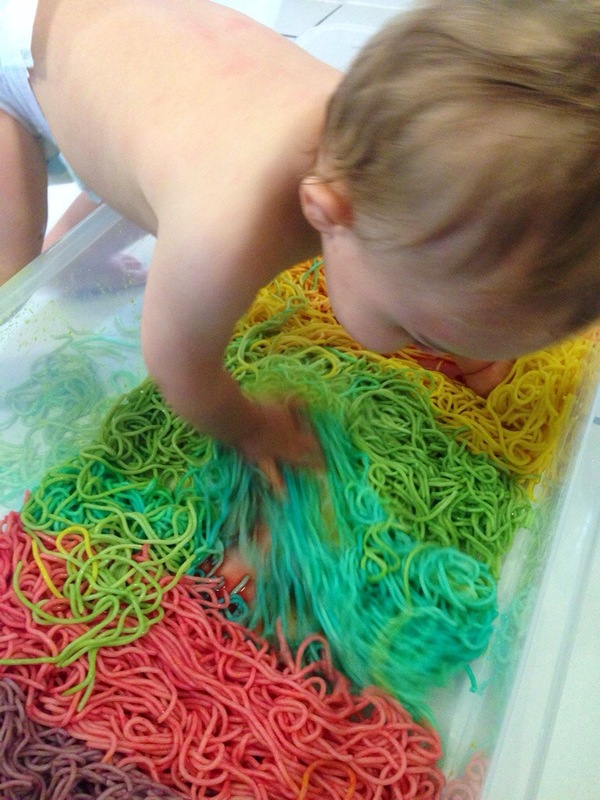 However, we still found time today for a super fun sensory play with Edible Rainbow Spaghetti. We got this idea from Asia at Fun at Home with Kids. This lady is a genius when it comes to kids play and sensory activities. Alternatively there are numerous recipes available on Pinterest. 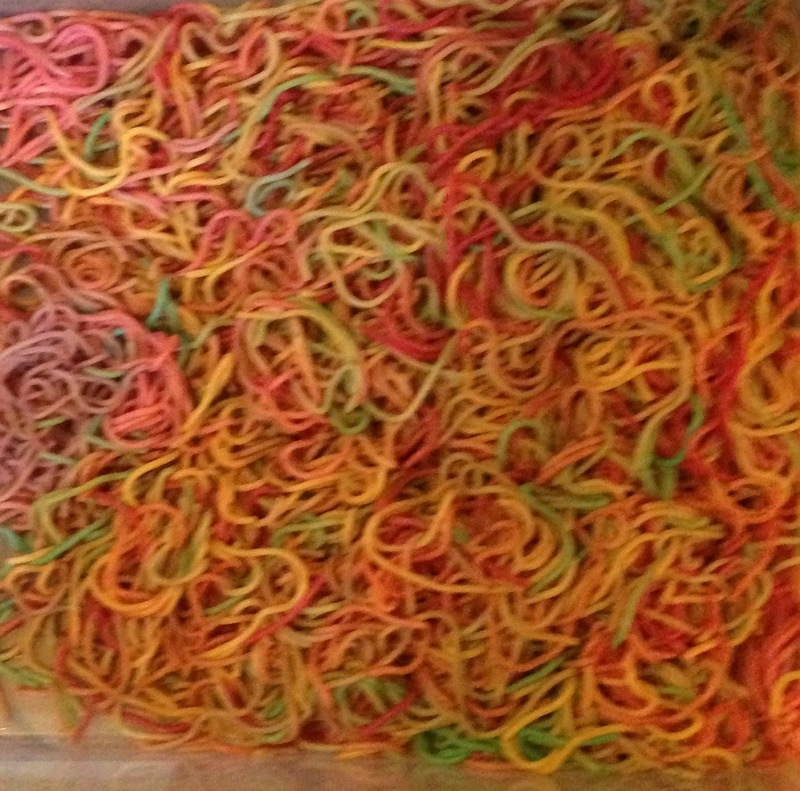 We used a 1 kilo bag of spaghetti and natural food colouring. For older kids who aren’t as greedy taste happy as Buddy, you could use liquid water colours for a nice vibrant colour. I separated the cooked and drained spaghetti into seven bags – you could use one bag and keep washing it out if you like… But to be honest I was also feeding Buddy his lunch and tidying the kitchen whilst making this, so I felt like I had enough to be getting on with! I then added drops of food colouring and shook the bags until I was happy with the colour we had achieved. A lot of the recipes online suggest you add water at this stage, however I found this diluted the colour a lot. I just drizzled a jug of water over the completed sensory tray to lubricate the spaghetti which made it super squidgy and slippery. We played with this on a wet and miserable day so we set the play up in the wet room to minimise any risk of staining. Buddy had just finished his lunch (spaghetti would you believe) so I was hoping he would be less inclined to munch! Buddy was very interested in the spaghetti and made a bee line straight for it. 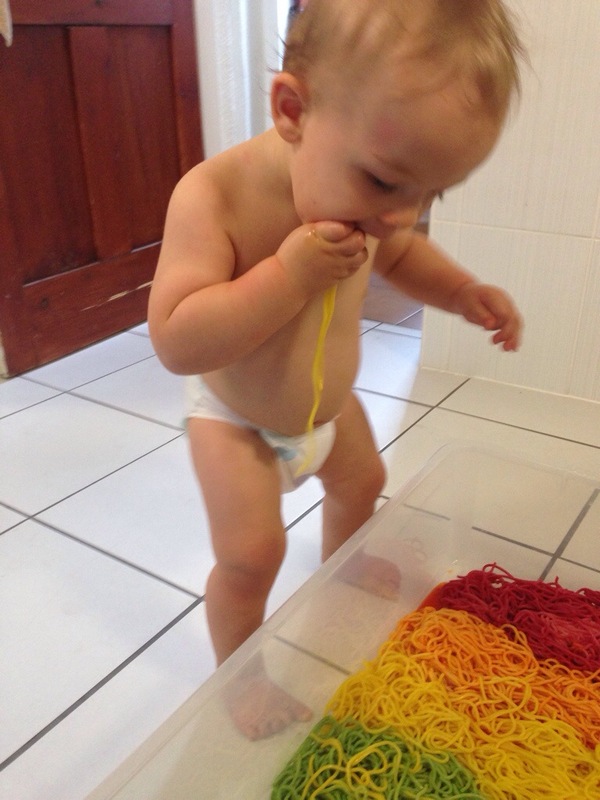 He seemed very attracted to the yellow spaghetti. In fact, it was worth a taste! 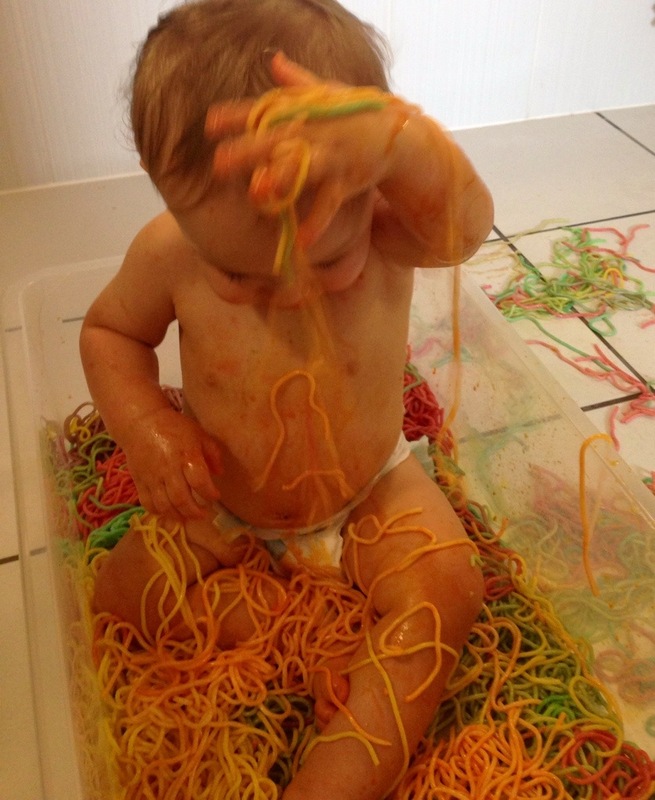 Buddy practiced shaking the spaghetti, and laughed when it fell from his fingers. It made a great “splat” sound on the bathroom floor. Buddy then decided to do exactly what I wanted to do…. 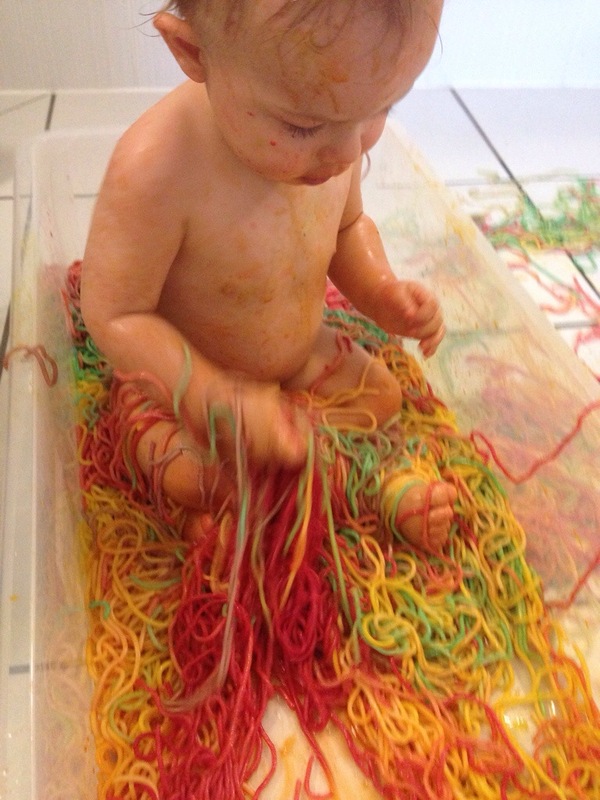 He went in with both hands, smooshing the spaghetti between his fingers and swirling the colours. Buddy then decided to climb into the sensory bin and he had a good munch and rummage! 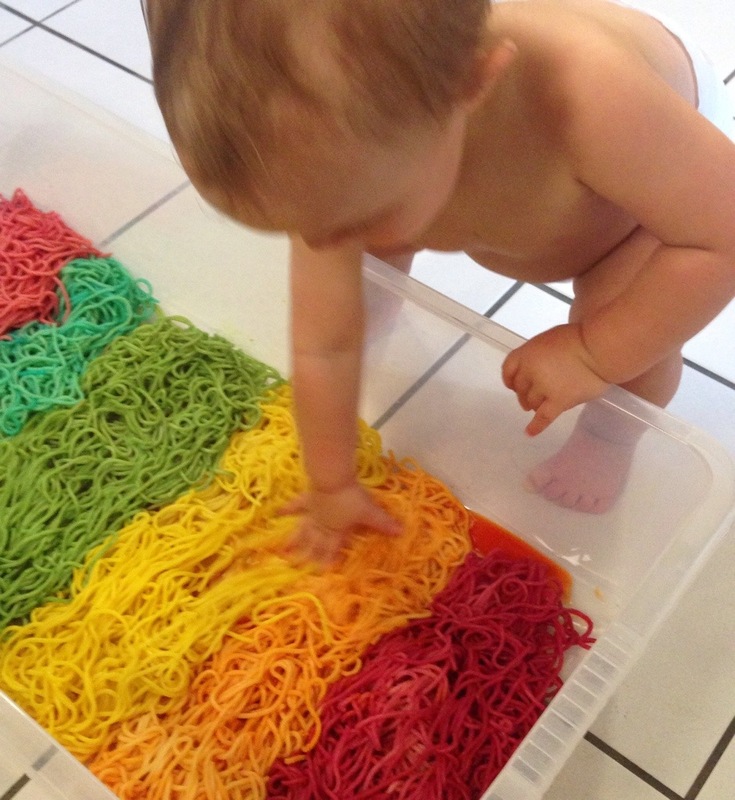 He enjoyed feeling the spaghetti between his fingers and had a brilliant time mixing all of the colours. Of course, there was a lot more tasting too. 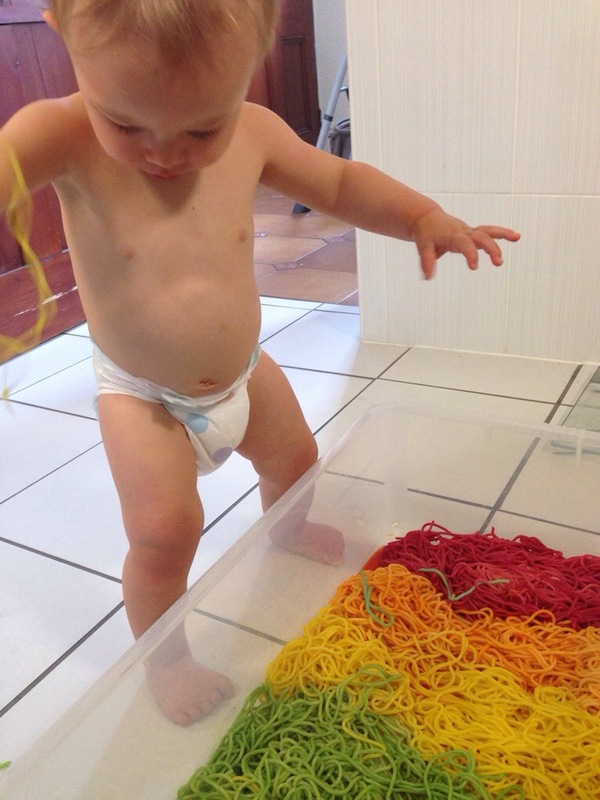 He then practiced dropping handfuls of spaghetti out of the box and onto the floor. The “splatting” sound continued to amuse him and it made a fantastic mess! 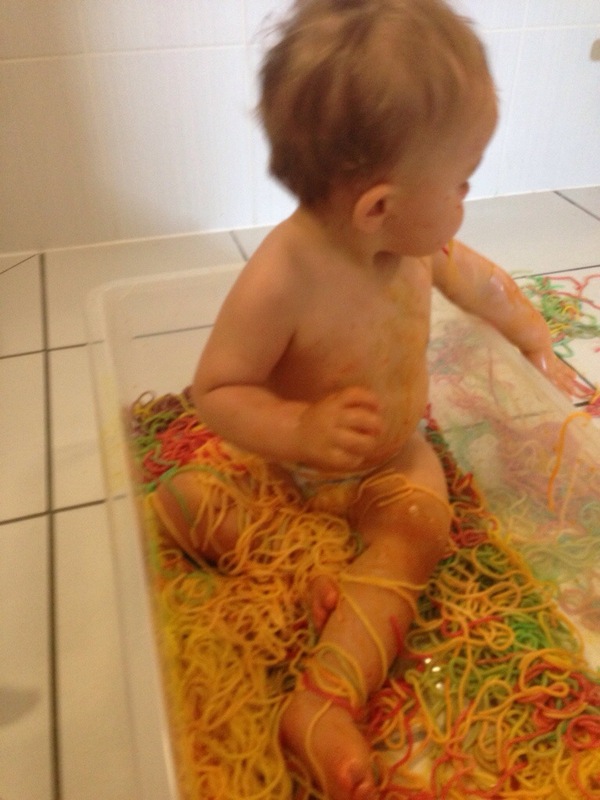 He loved feeling the spaghetti on his body and deposited handfuls all over his legs! This play was so much fun, we really didn’t want to stop! Unfortunately, Buddy was feeling tired so we called it a day. I did bag up and freeze the leftover spaghetti though. Even blended, the colours look great and I look forward to pulling this play out again over the next few weeks. 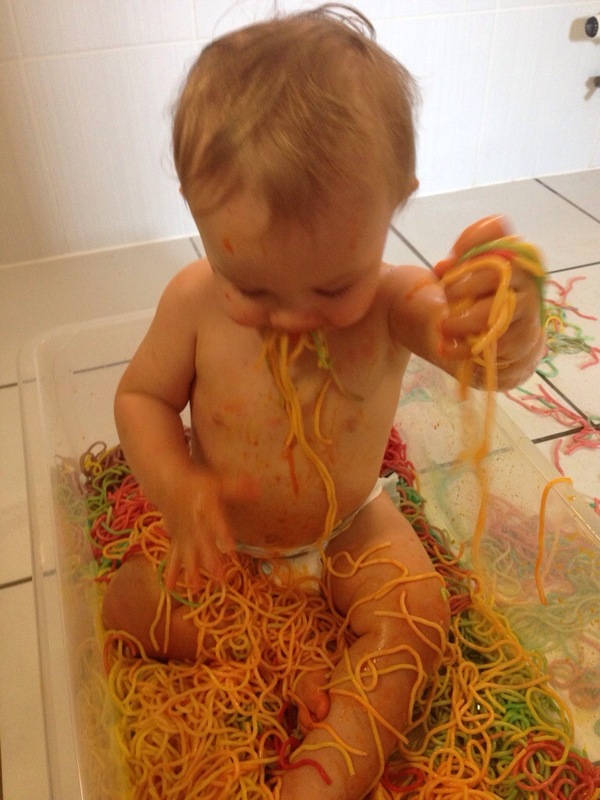 You can read about how we reused the spaghetti here. I’m glad you enjoyed it Caroline! Somehow Rainbow colours make everything that little bit more exciting don’t they! We had a great time and I look forward to trying it again sometime soon. 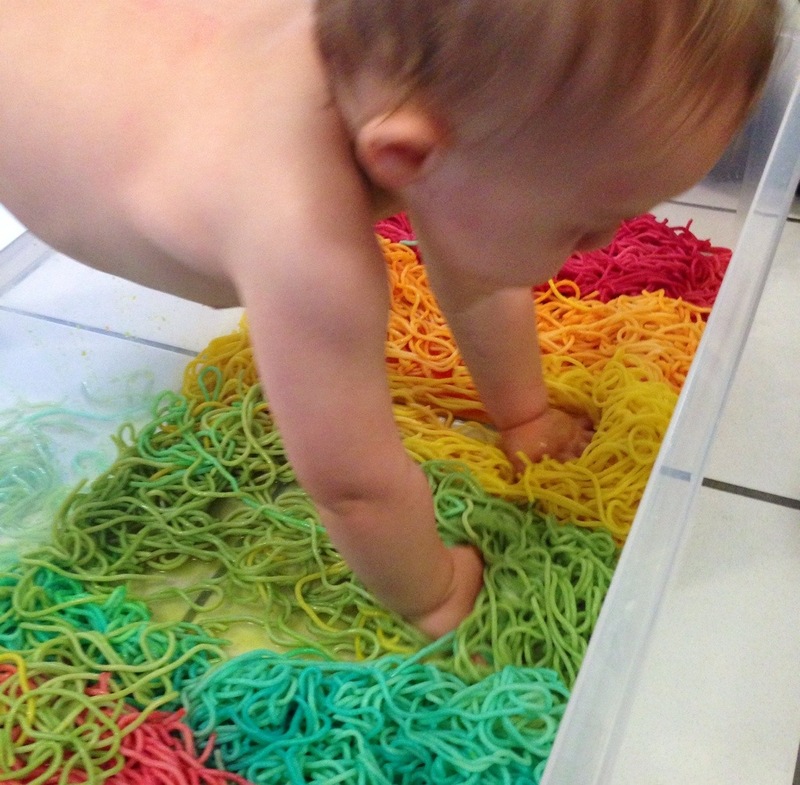 I wish my daughter would have loved this sensory play as much as your son! We tried once but she didn’t like the feel, I guess. We traced a few letters with it and she humored me for all of one minute!! Haha kids are great aren’t they! Sometimes I set plays up and Buddy looks at it thoroughly unimpressed! Thanks for popping in and taking the time to comment. 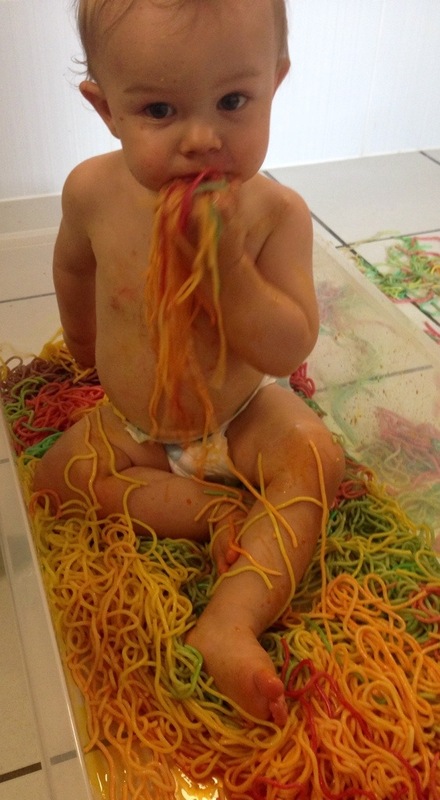 Thank younfor the brilliant ideas, how many packs of spagetti did u use? Hi Mary this was one 500g bag of spaghetti minus the portion Buddy had for his lunch just before we played! Question – i see some of the color got on his belly when he was playing – did it wash off easily? Im a teacher in an infant room and would love to do this with my babies but dont want to send them all home tie-dyed haha! Ooh that sounds fun! It came right off with some water. Hardly any scrubbing required. Awesome thank you! Finally getting around to doing this tomorrow! So excited! My daughter is a preschool teacher in Canada. I know that she would never think of using food in this way. 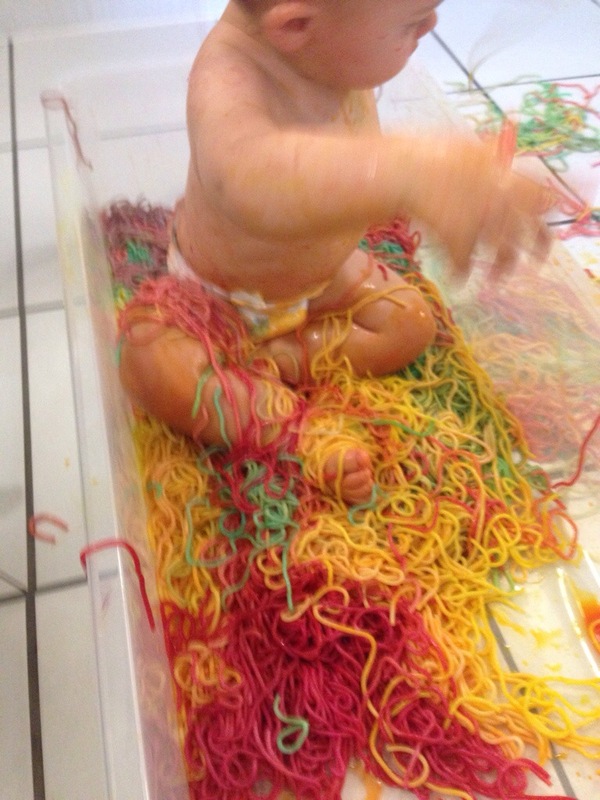 She has students in her class who could use this spaghetti that you so casually play with for their family dinner. I am quite shocked that so many people find this a good idea. Hi Heidy, thanks for taking the time to comment. Whilst I understand your point I must say that this is a play activity we engage with because it is a fantastic learning opportunity and as you can see from the article, my son did eat it. That spaghetti was purchased from Aldi and cost 30 pence. That works out at about fifty cents in American currency. 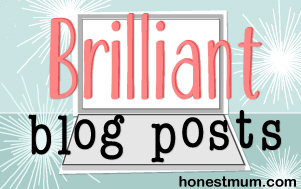 Whilst there are many free activities I could enjoy with my kids, I consider a 30 pence activity to be a fun and attainable activity for families on most budgets. Why don’t you go out and buy some spaghetti, and then donate it to the children in her classroom? Rather than harass a mom who used her own money, to buy something for her own child, to use how she felt was appropriate. Does anyone approach you, strangers at the store perhaps, and put you down for spending your money the way you want to? I’m guessing not. Therefore, you shouldn’t feel that you have the right to do it to someone else. Everyone is entitled to their own opinion and shouldn’t be made to feel bad about it. If you don’t have anything nice to say, you shouldn’t say anything at all.